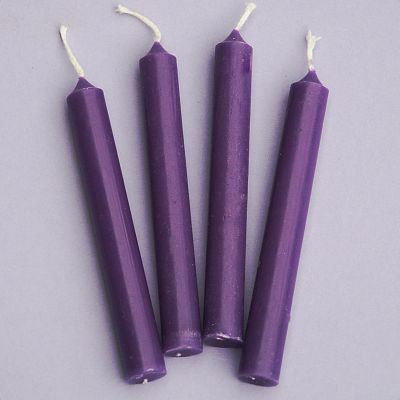 - Set of 4 purple candles. Often used for matters of power, healing severe diseases, spirituality, meditation, religion. Purple candles can be burned to enhance all spiritual activities, to increase your magical power, and as a part of intense healing rituals, in combination with blue candles. Approximately 1/2" in diameter by 4" long. Do you have any other questions about our Purple Candles - set of 4 mini candles?